Striper fishing on beautiful Lake Texoma the past week has been as good as it gets. We are catching limits of quality fish. We have seen some of the most fun days of striper fishing excitement so far this year. 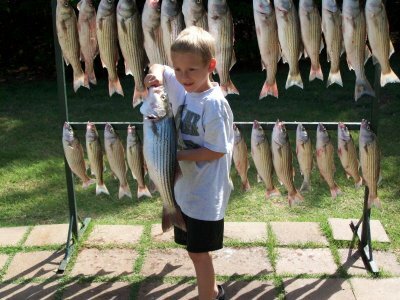 From the youngest to the most seasoned anglers, the excitement of a hard hitting striper is hard to beat. Over the past few days we have seen large schools of stripers feeding on the surface. Although I am are still fishing live bait, I have tried getting on othe start of the topwater actoin with some good results.